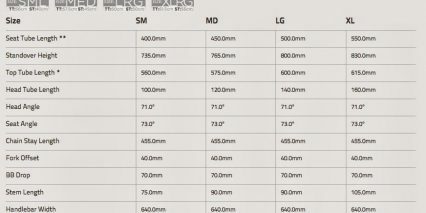 While the 2016 version of the Raleigh Misceo iE appears unchanged at first glance, the frame has actaully been extended and the rear tubing is box vs. rounded for improved torsional rigidity. 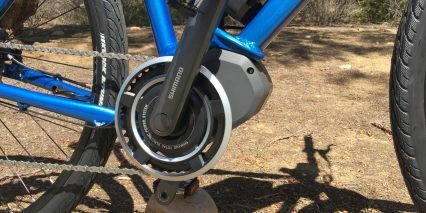 The drive unit is horizontal instead of being mounted at 45 degrees and you get automatic electronic shifting along with some other improvements. Read the review for the latest Misceo iE here. 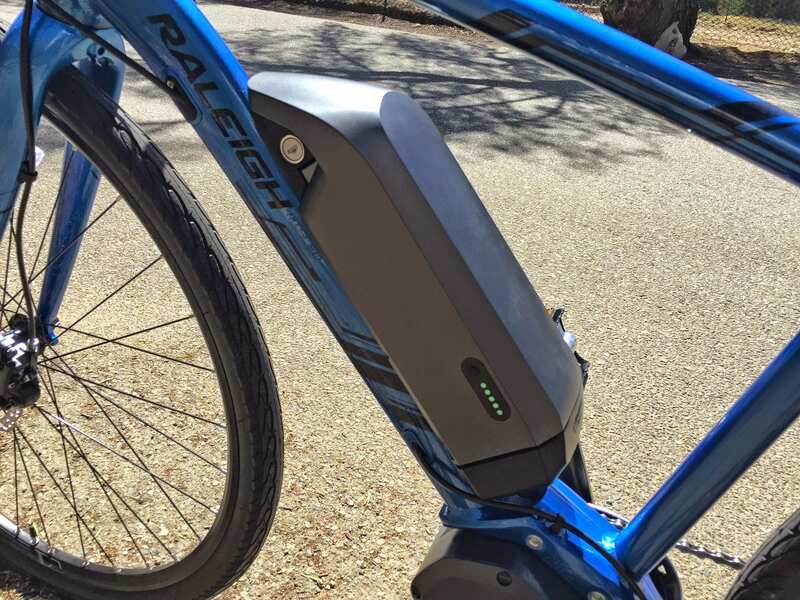 The Raleigh Misceo iE is one of the first electric bikes available in the United states to feature a Shimano STePs drive system… STePs stands for “Shimano Total Electric Propulsion System” and includes a battery, motor, LCD display and button pad for rider input. 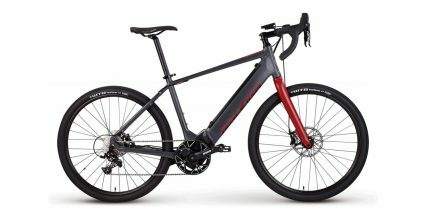 In addition to electric assist, you also get electronic shifting here in the form of Di2 (which stands for “Digital Integrated Intelligence”). Having never tried either system before this demo, I was impressed with how quickly and smoothly they both functioned and that they both ran off of the primary battery pack! 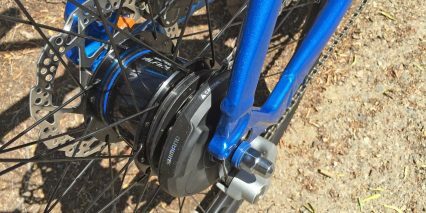 Di2 has been around since ~2010 and usually requires a small servo battery which is tucked below the bottle cage mount or hidden in the seat post but that’s not necessary here. 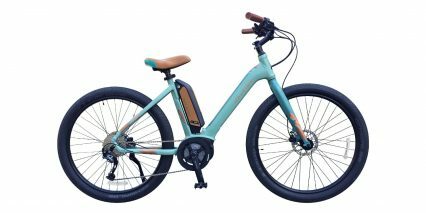 Most of the shifting, brake and electric cables are well integrated and tucked into the aluminum frame tubing and in my opinion the Miscoe iE looks very clean. 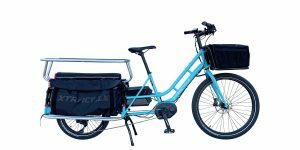 This is your everyday, around the neighborhood or city type of ebike that’s capable of becoming a commuter platform if you add a rack and fenders but stays light weight and simple if not. 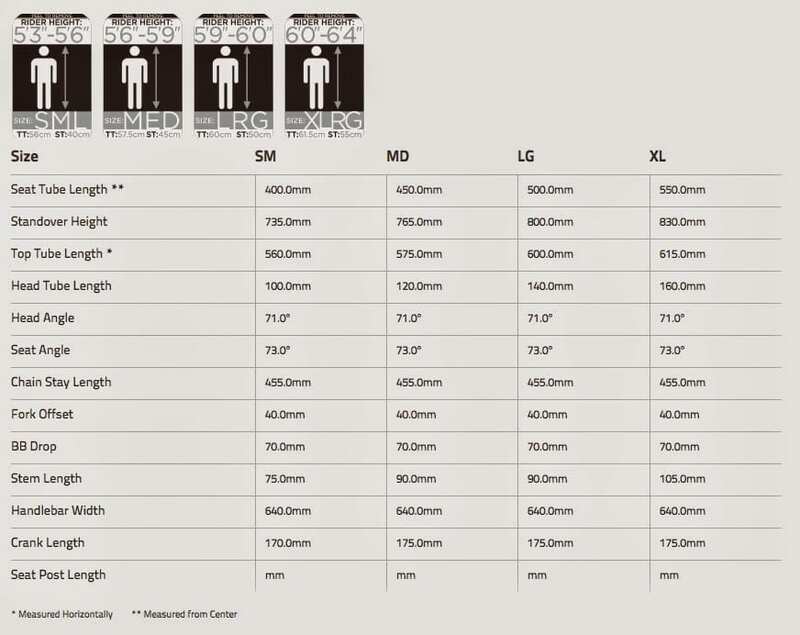 There are four frame sizes to choose from and I tested the medium 17″ which weigned ~41.7 lbs including the battery and motor. 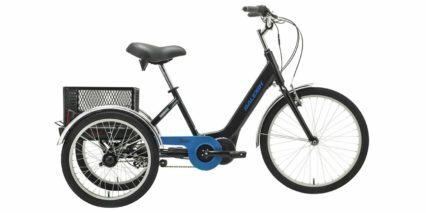 The motor driving this thing is a compact mid-drive that’s bolted directly to a specially designed plate joining the downtube, seat tube and chain stays. It offers 250 watts of nominal power and peaks around 500 watts which is comparable to the Impulse 2.0 system found on other ebikes from Focus and Kalkhoff. I found that the motor was powerful enough to zip me up to speed (20 mph tops) and climb medium sized hills. 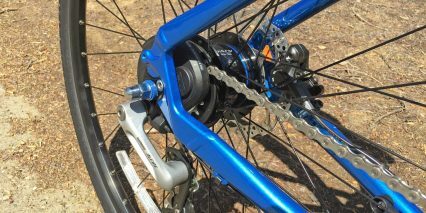 The front chainring offers 38 teeth and has a nice plastic chain guide along the outer edge that should keep pant legs grease and snag free. 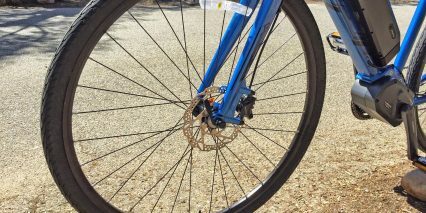 Despite the more traditional size of this sprocket, I found that it did not over-rotate when I ceased pedaling. 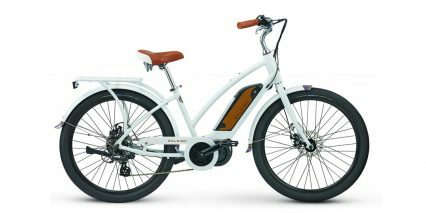 This is important because there are no motor inhibitors present on the brake levers for this electric bike. 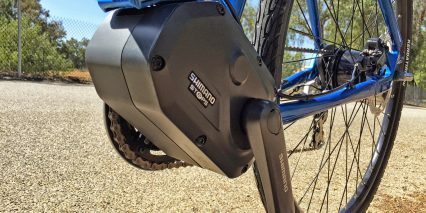 It’s a pedal assist only system which does have shift sensing but relies on other sensors to start and stop the motor based on rider input. 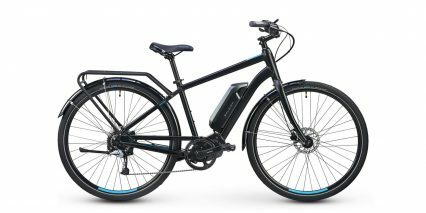 Just like the Bosch system, the Shimano electric bike motor responds to the rear wheel speed, pedal cadence and pedal torque. 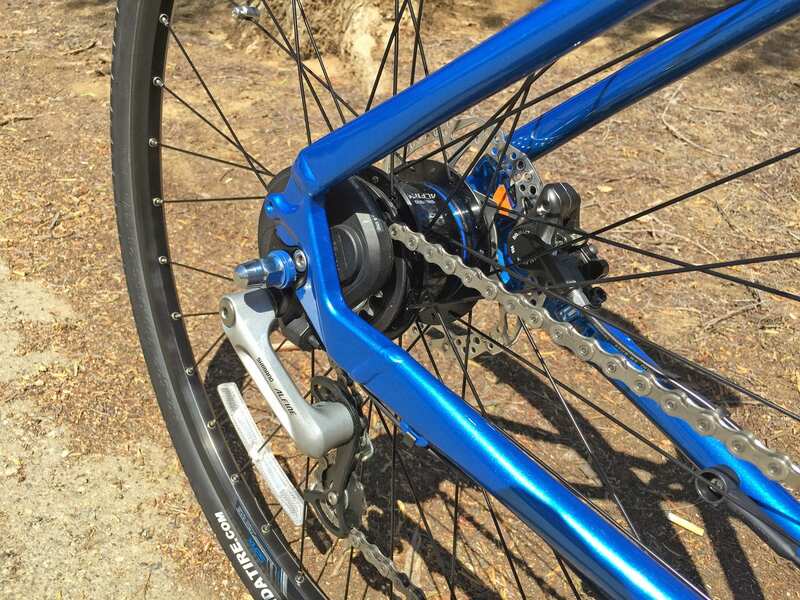 It’s satisfying and very efficient given the eight speed internally geared Shimano Alfine rear hub. At just over 7 lbs, the motor is smaller and lighter than most of the others I’ve tried and it blends into the frame very naturally. 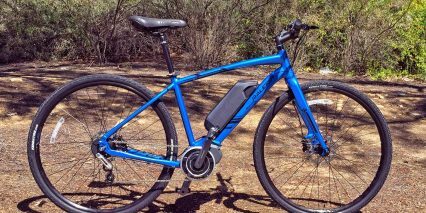 Powering the display, electronic shifting and motor on this electric bike is a handsome, removable Lithium-ion battery pack mounted low and center on the downtube. 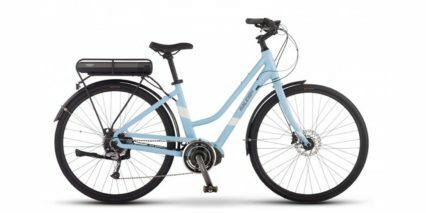 This pack occupies most of the triangle space above the downtube but Raleigh has managed to add bottle cage bosses on the seat tube for the production version (they aren’t present on the demo model I reviewed). 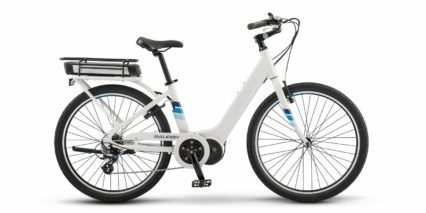 I was surprised that the pack has to be completely taken off of the bike in order to be charged. And, I was kind of shocked with how large the charging port interface is? 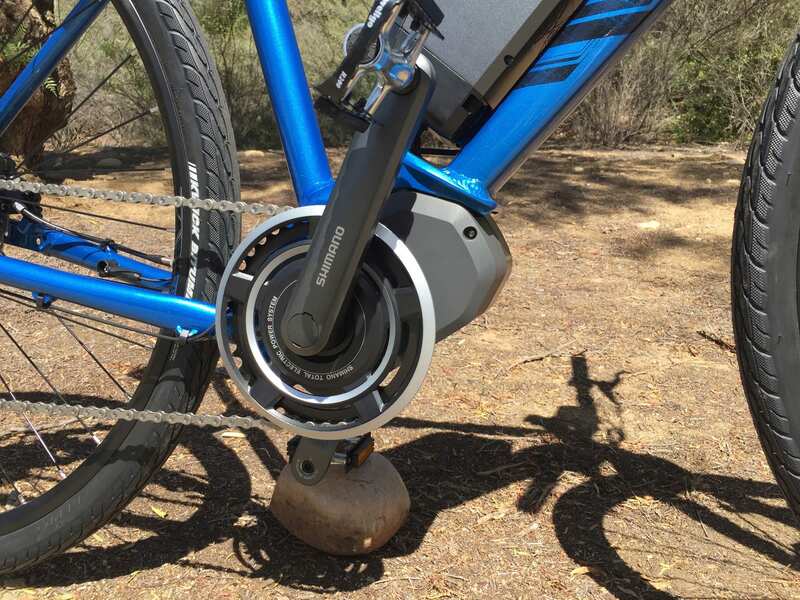 I feel like Shimano should just hop onboard with the small, circular magnetic EnergyBus charging standard and definitely add a port to charge while mounted to help users save time and avoid accidental drops. 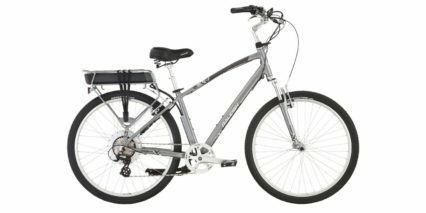 The pack weighs about 5.8 pounds which is fairly light given the healthy capacity it offers. 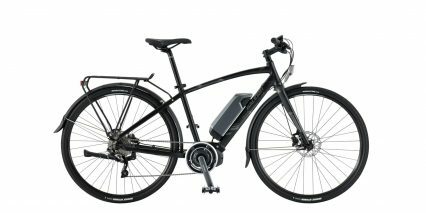 Once off the bike, it has a little integrated handle which makes transporting it easier and safer, and there’s also an LED charge level indicator on the left side so you can quickly determine whether to plug it in if you haven’t ridden for a while. To help extend the life of this and most other Lithium-ion packs I recommend storing it in a cool, dry location and keeping it between 20% and 80% charged at all times, check to make sure it’s at 50%+ every few months if you aren’t using it. 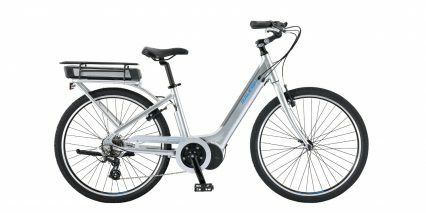 The pack offers 36 volts of power and 11.6 amp hours of capacity for a total of ~416.6 amp hours which is a touch above average. 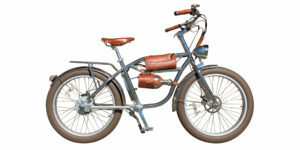 Activating the Raleigh Misceo and navigating through its three drive modes and eight gears is surprisingly easy. 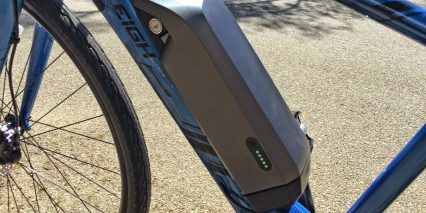 There’s just one power switch and it’s a little round rubber button on the left side of the battery pack, near the LED power readout. Press this for a couple of seconds and the primary display comes on. It’s designed to be backlit all the time and I imagine this only skims a bit of battery while de-cluttering navigation options and buttons. The display is about the size of a book of matches and can swivel front and back to help reduce glare, even with the protective sticker still on the demo model I tried it was easy to read. 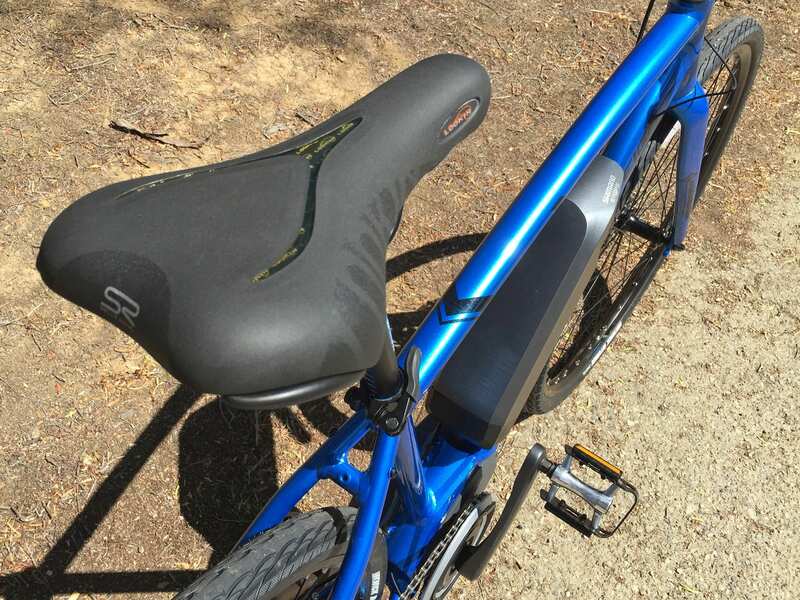 Located just to the inside of the brake levers on either bar is a rectangular button pad with a black button at the top which navigates through the different menus. 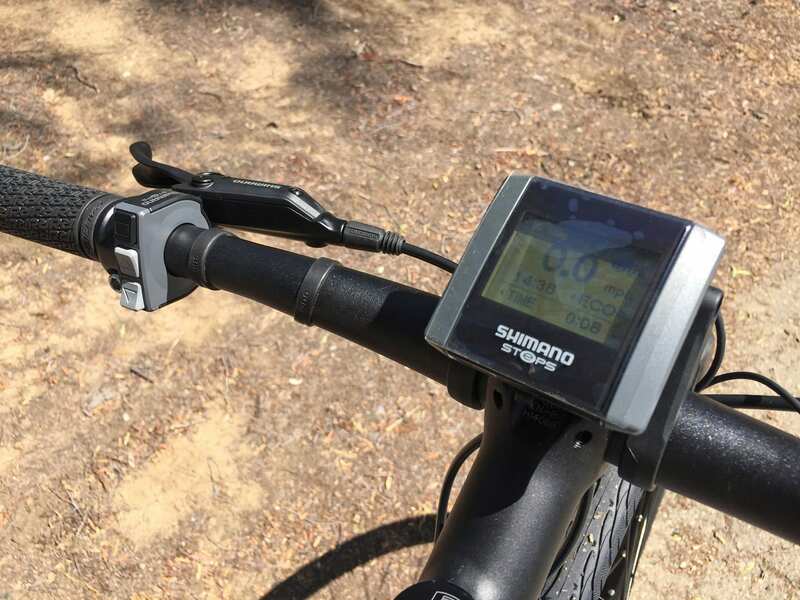 There’s a traditional speed, battery level and distance view as well as one that estimates your range in all three levels of assist and two other screens that show your drive mode setting or the pedal gear setting. 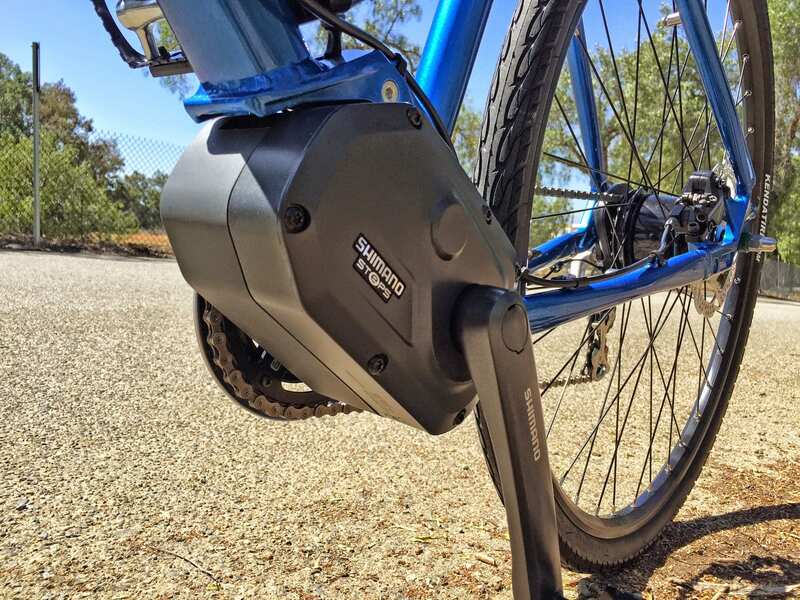 Given the electronic servo noise of the Di2 system, I didn’t feel like I had to look down often to see which gear I was in… I just rode this thing like a bicycle and the systems responded naturally. If I wanted to go faster, I pressed the up gray button on the left for more drive power. 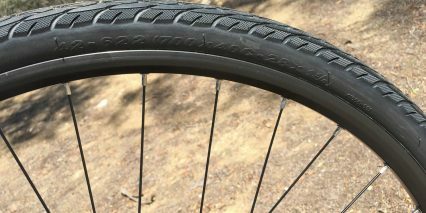 If I wanted to change my pedal cadence for climbing, I pressed the down arrow on the right side to shift to an easier gear. Pretty simple, motor up and down on the left and gears up and down on the right :) I did like that Shimano included a zero level here for riding the bike in normal pedal-only mode. 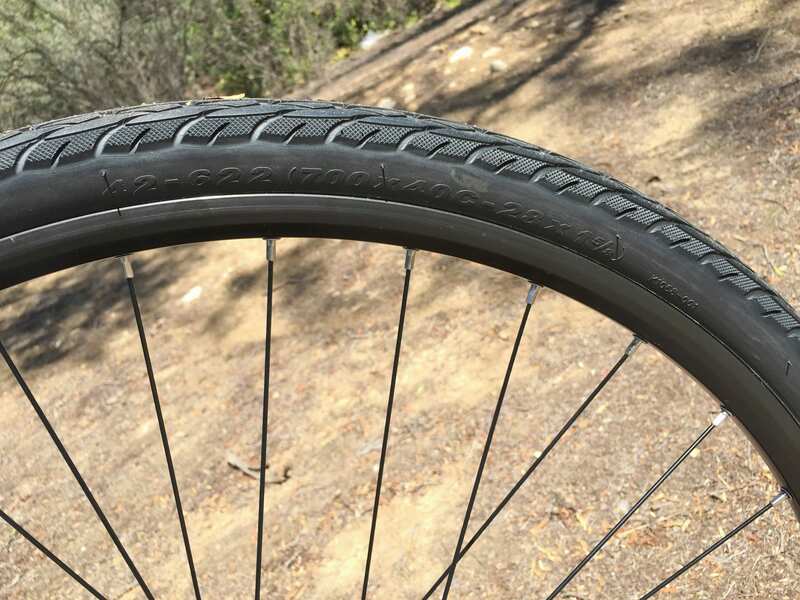 This works surprisingly well given the efficient 700c ~28 inch diameter wheelset, efficient near-slick tires and stiff responsive frame. 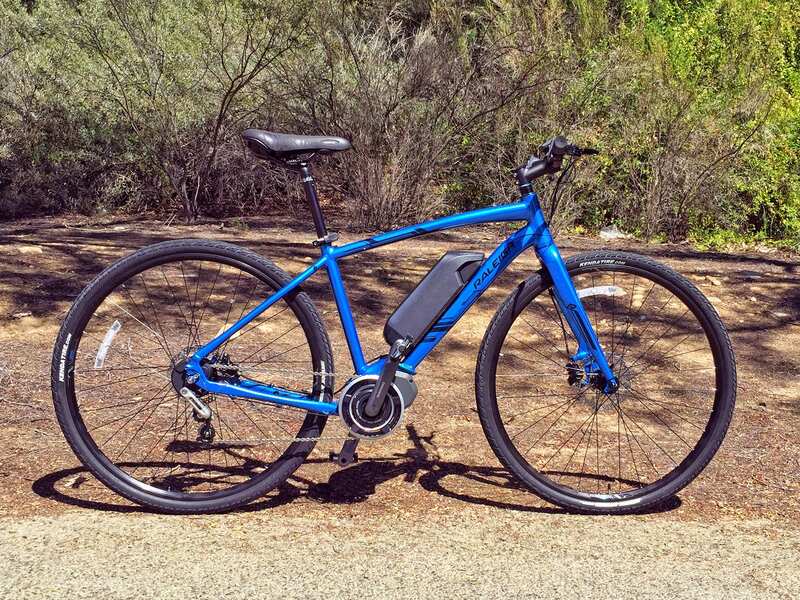 Unlike some other ebikes with heavy frames and obtrusive batteries, the Misceo felt fun as a bicycle only and could easily pass as a normal bike if you completely removed the battery pack… but then the gears couldn’t be shifted because the Di2 system is electronic. 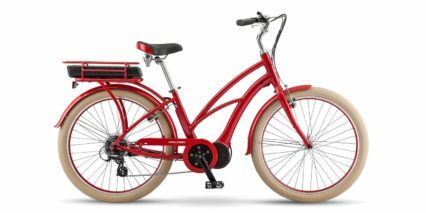 Raleigh is a bicycle company that has been around for over 100 years, since the late 1800’s, and it’s neat to see them being an early adopter in the electric bike space. 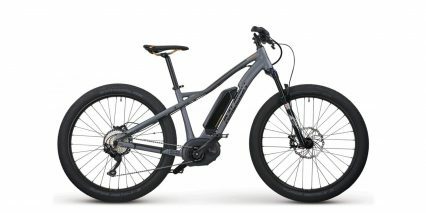 This, more than almost any other electric bicycle I’ve seen to date, just feels like the next step in what a bicycle should be. It’s a fairly traditional platform with a dash of new technology refined to stay out of the way and work intuitively. 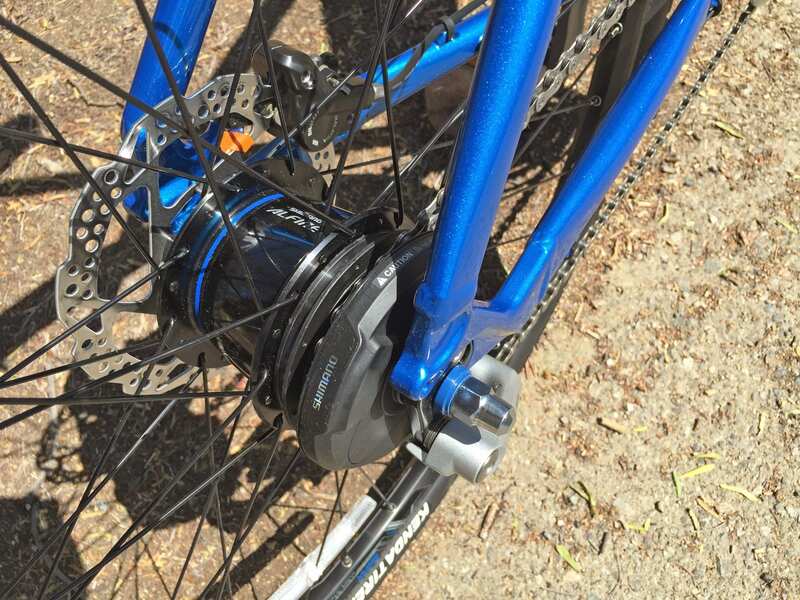 Opting for an internally geared hub instead of sprockets keeps the drivetrain cleaner, can be shifted at standstill and keeps the chain shorter and tighter. 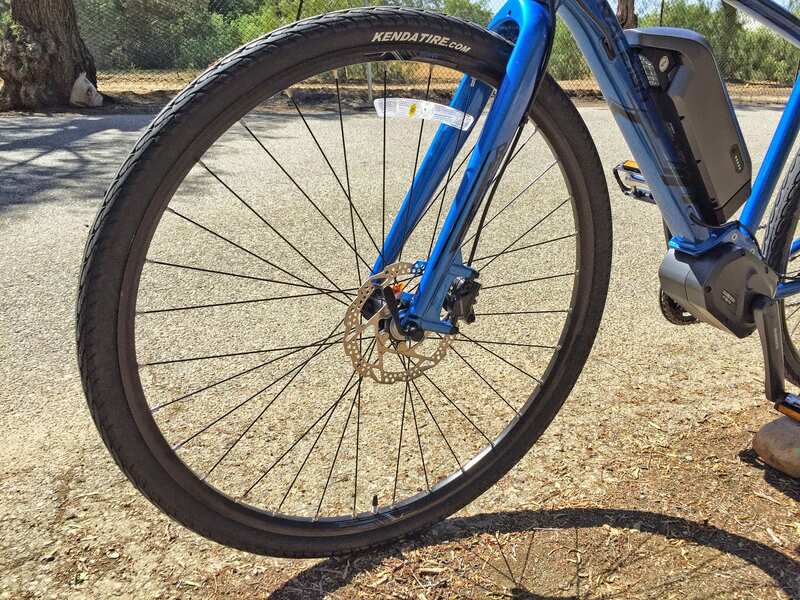 Opting for electronic shifting allows for more precise control, requires less effort (if your hands are cold or strained), is not affected by stretched or worn cables and reduces shock on drivetrain components. 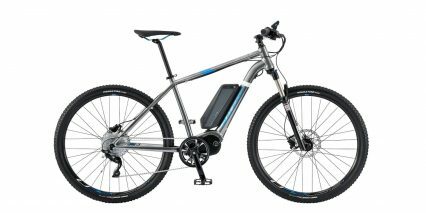 Opting for electric assist in general helps you ascend hills, avoid sweating, travel further and reduce joint pain. 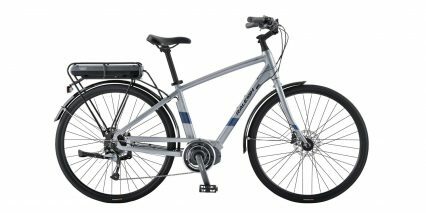 A few of the highlights on the Raleign Miscoe-iE for me were the carbon fiber fork which keeps the bike light and reduces vibration. 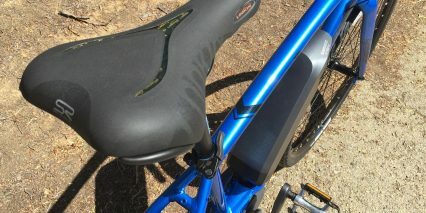 I also liked the Selle Royale gel saddle and the Shimano M445 hydraulic disc brakes. 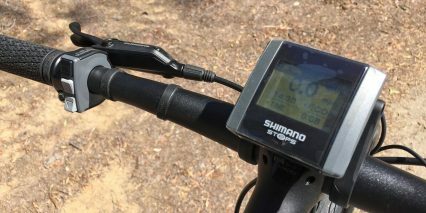 It’s neat that this ebike automatically switches gears back to level three after five seconds of rest if you’ve been pedaling in a higher gear (this makes it easier to start from standstill at a stop light or stop sign) and that the two electronic control pads are so small, symmetrical and well integrated. You can actually switch the functions on the control pads so that shifting is done through the left pad instead of the right if you so prefer (note: this will require the help of a Di2 certified technician). In my opinion, the Misceo iE is a solid offering that’s lighter, sleeker and more affordable than some of the other fancy mid-drives out there. 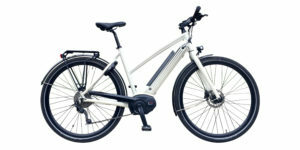 Court, after reading your & several other Misceo reviews my #1 impression is summed up by your statement, “This, more than almost any other electric bicycle I’ve seen to date, just feels like the next step in what bicycle should be.” The only ‘old school’ aspect to this bike seems to be its non-integral, off-bike charging battery. Otherwise, what a great blend of price, weight, performance, quality and innovation. 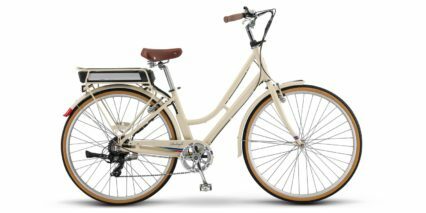 Court, do you have any indication that Raleigh is considering a similar but hybrid model with front suspension & wider tires? 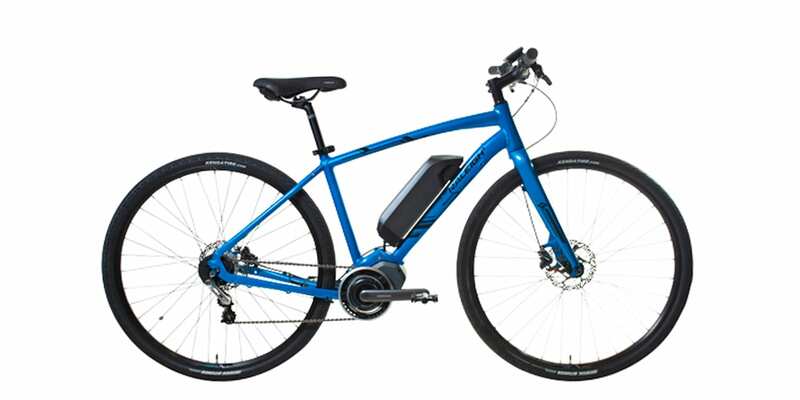 This is somewhat beyond my budget but I’d consider stretching for it if it was closer to my mixed needs of cross-town commuter and riding on the city & county’s packed & mostly maintained trails. This review, like some others, suffers from one significant omission: after-sales support. What does one in SC, NE, WI or ID do if (eventually, when) the drive & control systems hiccup and need some attention? Wouldn’t it be fair to list a Con that widespread technical support for STePs & Di2 is not yet widely deployed? Or might always be located exclusively in major biking areas? Just something to think about as you conduct your future, excellent reviews. 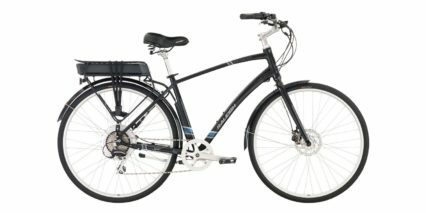 Questions about the Raleigh Misceo iE. I can buy the 2015 or the 2016 for the same price. Besides the water bottle stays you stated that the frame has been modified. 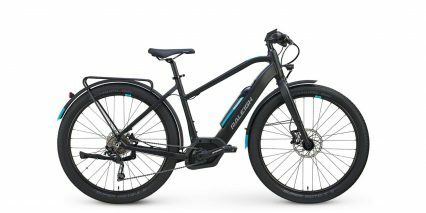 What are the advantages of the new frame design? Right now my dealer doesn’t have the 2016 model in stock. Because of the changes would you avoid the 2015 model or try to negotiate a better price? I’d request that the firmware be updated and negotiate for a lower price given that the battery is likely older and thus slightly degraded (from what I understand batteries degrade over time even if you aren’t using them). Hi. 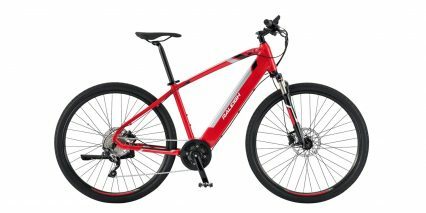 Is $900 a good deal for a used 2015 Misceo iE? The frame is beat up, but the motor looks and runs okay. There’s not many used ones yet, so hard to find comps. 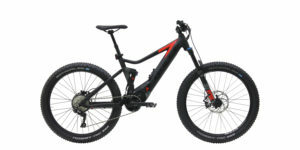 Also, is this a better bike than the Magnum Ui5? Thanks for all the help. Big newbie here. Hey Dan! That’s a pretty good price for the used Misceo… Frame dings and scrapes don’t worry me as much as older batteries or a messed up display. 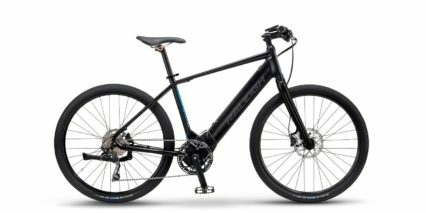 You can (and probably should) take it to a shop after to have the drivetrain cleaned and aligned, they might also true the spokes for ~$100 total. This would get you set for riding. 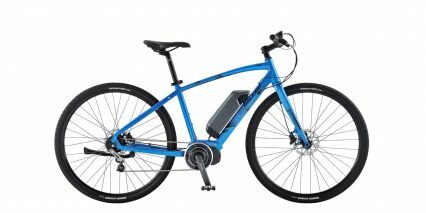 I do believe Shimano will be offering their STEPs battery for a while but this is your chance (maybe the next year or so) to get a replacement. I’m guessing it would cost ~$700 but it would ensure that you’ll get at least a few more years use if you take care of it (store in cool dry locations, not super hot or cold). So now, add some of those costs to the used price and compare it with a new bike or the Magnum Ui5. 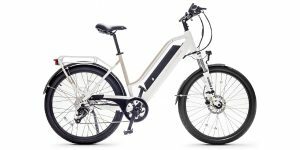 I personally think Magnum does a great job and offers good value but the Misceo iE is a pretty sleek bike with good components. It might come down to your personal preference. If you can get the Misceo used and it runs for a while without that battery then you’re doing pretty well! Thank you very much Court for you (extensive and very helpful reply). 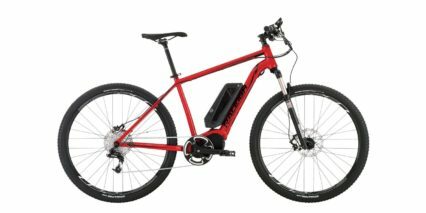 One last question if I could be so bold… I could also get a new Evelo Aries Review 500w bike for about $1100. Is that a better deal? It’s so hard to compare these bikes… not even apples to apples; feels like apples to pineapples. And there really isn’t any sense of a real price for used bikes. I guess they’re so new that people haven’t sole ’em yet. Thanks again. Wonderful (and informative) site.